Cigarette distributors in New Jersey will soon have to meet new license requirements. The state Division of Taxation adopted revised regulations that change the New Jersey cigarette tax bond amounts. All cigarette distributors and wholesale dealers have to get licensed with the Division. Posting a cigarette tax bond is one of the requirements they have to meet. With N.J.A.C. 18:5, the amendments to the Cigarette Tax Act adopted on June 5, 2017, the bond amount that distributors need to provide will be formulated in a new way. The text of the amendments is available in the New Jersey Registry. Until now, cigarette distributors in New Jersey had to post a $6,000 bond, so that they receive their state license from the Division of Taxation. The purpose of the cigarette tax bond is to guarantee that licensees will pay all due taxes and fees on cigarette sales they have made. The new rule alters the bond amount that distributors have to cover. The bond must be equal to the average monthly value of the cigarette stamps used. This means that distributors who process larger volumes of sales will need to provide higher bond amounts. As previously, the official bond form needs to accompany the Cigarette Tax Distribution License Application. For many cigarette distributors, the amendments will raise the bond amount they have to post. While this may mean higher bond costs, it does not necessarily have to result in that. If your volume of sales is larger, you can work on improving your financial situation, so that your bond cost is lower. The bond premium you have to pay is determined on the basis of your credit score, business finances, and assets and liquidity. If possible, work on boosting your credit situation, and make sure you demonstrate the strength of your finances. This will have a direct effect on your bond price. Start your New Jersey cigarette tax bond application today! Why us? 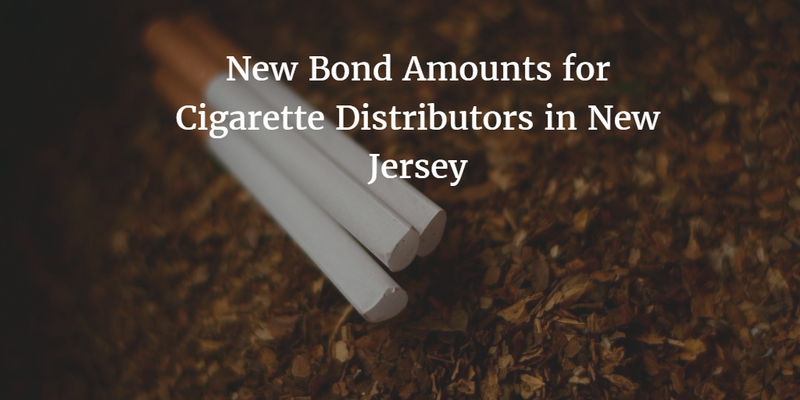 Need help with the new cigarette distributor bond rules in New Jersey? Call us at 866.450.3412 and our bonding experts will help you out.